HP3 looks a bit like an automobile jack but with a vertical metal tube up front to hold the 16-inch-long (40-centimeter-long) mole. 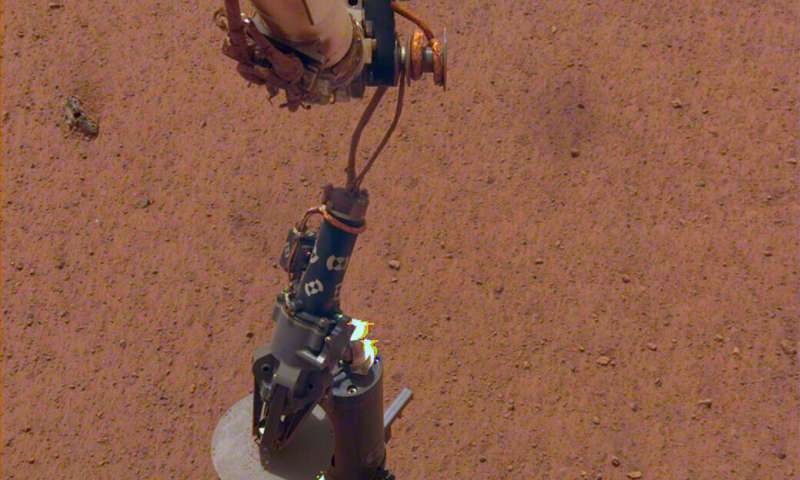 A tether connects HP3's support structure to the lander, while a tether attached to the top of the mole features heat sensors to measure the temperature of the Martian subsurface. Meanwhile, heat sensors in the mole itself will measure the soil's thermal conductivity—how easily heat moves through the subsurface. Curious, does the "self hammering spike" create noise in the seismometer? Of course it does - the hammer/mole will create a lot of noise in the seismometer readings until it reaches its' operating depth. While that's happening, the seismometer (which is VERY sensitive) is basically on standby, taking readings in the hammer's "rest pauses", but those readings will also be affected by relaxations of the subsoil, and thermal stresses in the soil and in the mole caused by the mole's heating/cooling cycles. Only when the mole is ready to take measurements of heat flow from the interior will the seismometer be able to start it's main phase of taking measurements. That will be a few weeks away. I concur, it seems they will take advantage: "As the mole burrows, it should also generate vibrations that SEIS can detect and yield information about the Martian subsurface." Who dares to apply the rectal thermometer?